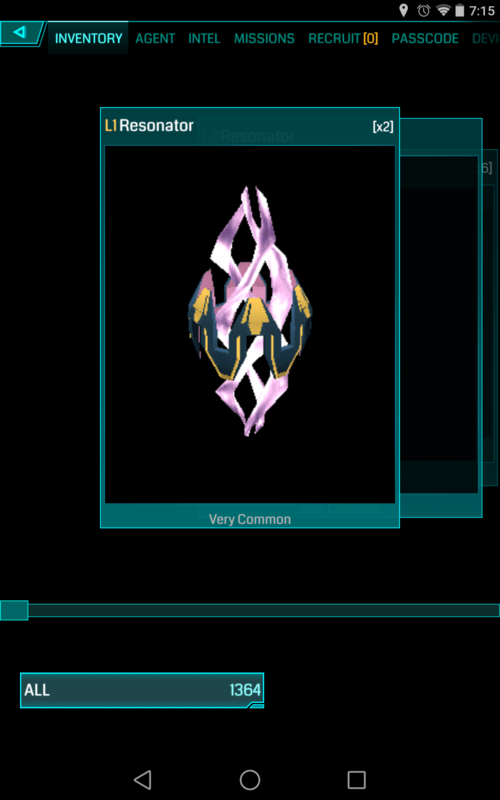 Ingress items can be acquired with your scanner by hacking portals, picking up dropped items, through a field kit for leveling up, or via Passcodes. When you start playing Ingress you will not have any items. Items could have a level from L1 to L8. And can be Common, Rare, or Very Rare in type. Since the 4th of November 2012, a new Item limit is enforced. Agents need to have less than 2000 items to be able to acquire more . When you select an item in your inventory you have an option to drop it. The Item will stay in that place in the game for about 12 hours and all other players who come to that place can see it and pick it up. After 12 hours, the item will disappear. This makes trade possible,but also theft, so be wary of where you place your items. If possible, try to conduct trades away from busy roads and intersections as the items may be noticed by enemy or even friendly players. Mass transfer of items is now possible thanks to the use of the new Capsule technology. It allows you to store within it a combination of any 100 items including keys. The same limitations apply with the old style of transfer, you must drop the capsule to transfer to another player, so it is possible for the enemy to take your loot, but is a much more efficient transfer.